Class continued its slow increase to 27 people tonight, with one who is brand new to the workshop. Our games tonight: Character Intro, What Are You Doing?, Tag Out Story, Animal Transform, Irish Drinking Song, and 3 Line Drill. 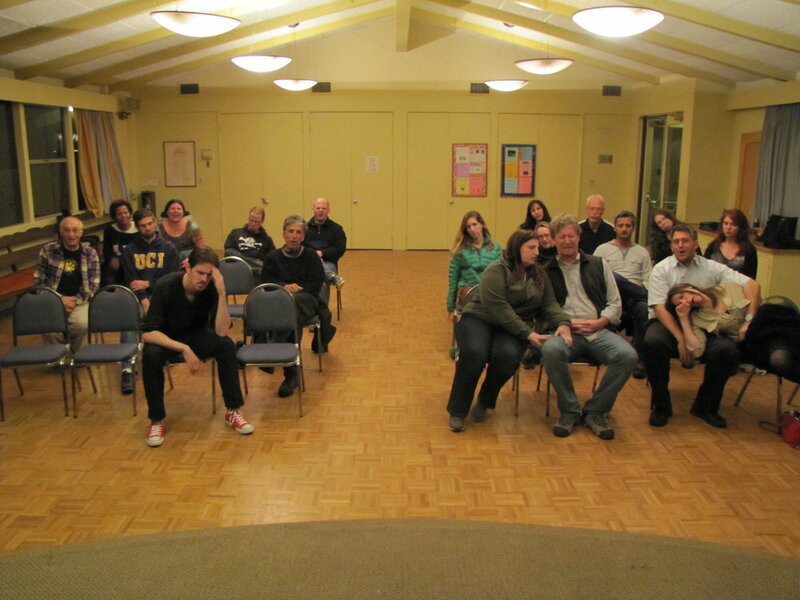 Tonight's class had 26 people, including some faces we haven't seen in awhile. No brand new players, but the return of a few for their second class. Some pretty basic warm ups, starting with Character Intro, then on the Whoosh, Bang, Pow, and One Word Story. Then came Counting Words, Party Quirks, and Beasty Rap. The header image is from one of the Beasty Rap scenes, and shows Mark, Cora, Brian, Debbie, Steven, and Eric. We took some time from tonight's class to remember Ben Woolf. A previous post gave some of Ben's history with the Santa Barbara Workshop, and I wanted to give those who knew him a chance to say a few words. This is the first time we've had a memorial for anyone who attended class, and I think it was an appropriate tribute. I don't have many pictures from this night since I didn't bring out the camera until the end. They're all from the 185 scenes. There were 25 people in tonight's class, none of them brand new. We warmed up with Character Intro and One Word Story. Our short form games were 5 Letter Word and Switch Dubbing. We did the Irish Drinking Song and ended with 185. I'm a bit behind in postings, so I'll make this quick (you all just want to see the photo gallery anyway). Two new players joined us this week for a total of 25 in class. We started with Slap, Clap, Snap, then came One Word Story in two groups. Our short form work consisted on Club Photo to Scene and Emotional List. Everyone did Beasty Rap, and we ended with two Montage groups. Class was back up to 28 people this week with 5 new to the workshop. We didn't get to as many scenes as I would have liked, so the next time we get such a large class I'll switch to games which use more players. We started with Character Intro and moved on to Whoosh, Bang, Pow. One Word Story ended the warm ups, and we moved on to short form work. I only got us through a complete round of 5 Letter Word scenes before it was time for the Irish Drinking Song. After that we did a few rounds of Four Square. I did write down one line. I think it was delivered by John in his 5 Letter Word Scene - "this kettle ain't going to fill itself!" It was probably funnier in context. This week we were down to 19 people, so we did some 2 person scenes. And although I brought the camera, there are only a few pictures from the end of the night. This first picture perfectly captured the sadness class feels when we have to stop. Our warm ups consisted of Character Intro, Zulu (sometimes called Categories), and One Word Story. All were done in one big group. For our stage work we started with a full round of Hitchhiker. Then we moved on to No P, followed by Pillars. That was done as a rotation, with word givers becoming performers in the following scene. This week the musical piece was Beasty Rap, and then we finished with 185. We divided the class into only 2 groups for that piece and it went particularly well. Somewhere on Facebook is a video of a group doing "185 bras walk into a bar...". Sorry everyone, but I'm going to have to cancel this week's class (January 28). Unfortunately, our usual facility is being used for the annual homeless count, and our usual alternative locations already have other scheduled activities. The Unitarians were most apologetic, but they were constrained by other obligations. Other alternative locations didn't pan out, which has been my past experience. Facilities like we need are expensive and often booked up. I decided to make the call now so that I've got time to get the word out. I'll be posting to the Facebook sites, making a Twitter announcement, and emailing those I have addresses for. I'll also post signs at the location. We will be back the following week (February 4) at our usual time and location. Wouldn't you know, last week three people brought cameras and took pictures. This week we had none. So, no pictures this post. Class was smaller, counting in at 21 people (yeah, that's a "smaller" class), and that included two people new to the workshop. We started with Character Intro, and then did two rounds of Enemy Defender. Next came a simple version of Pass the Clap, and then right into One Word Story, this time everyone in one big group. Another big class this week: 27 people all told with 6 new to the workshop. Big classes are always fun with lots of energy, but I need to change some of the exercises around so that we can get in a few more games. Speaking of which, we started the night with Character Intro, Limericks, Ball Transform, and One Word Story (two groups again). Then on to Standing-Sitting-Bending and a new one for us, Decreasing Scene. That one was done in groups of three, and started with a 30 second scene. Then the scene is replayed as a three word sentence scene, and the final round is replaying it with no words. It was a good learning piece, challenging for everyone, and was quick. We finished the night with Beasty Rap, Switch Dubbing, and Freeze tag. Now that I see the whole list, we got quite a few pieces in! This week we had better cameras, so here are a few pictures. Our first Wed. night workshop of 2015 was well attended with 28 people including 6 who were there for the first time. We also had a few returnees whom we haven't seen for quite a while. Big classes are always fun, even though we don't get as many games in. There's a lot of energy, and you get the opportunity to work with different players. Warm ups consisted of Character Intro, Whoosh/Bang/Pow, and One Word Story (divided into 2 groups). 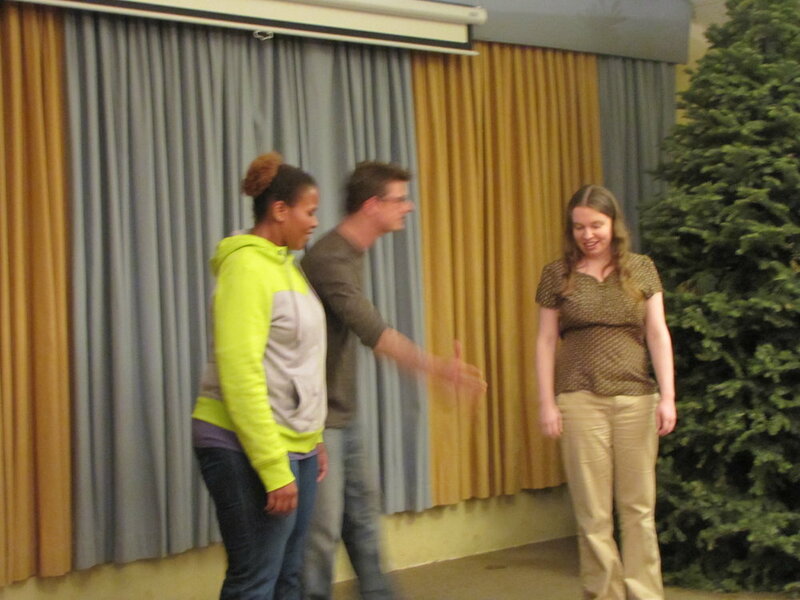 I got to do my favorite Improv 101 talk (with the lovely vase of flowers), and then right into 5 Letter Word. Next was Entrances and Exits, followed by Irish Drinking Song, and we ended the night with Freeze Tag. And yes, that is a Christmas Tree on the side of the stage. Just a quick reminder that we are back in action again this Wednesday (October 30, 2013), at our usual location - Jefferson Hall at the Unitarian Society, and at our usual time - 7:30 pm to 10:00 pm. P.S. Okay, I had to go back to my records from 2011 to find an appropriate photo for this post. I need more class pictures! This week ONLY (October 23, 2013) we are cancelling the Wednesday night workshop. The facility is being used for the annual Starr King rummage sale. We will be back to our regular schedule on Wednesday October 30 starting at 7:30 pm. Sorry for the inconvenience, and I look forward to seeing you NEXT WEEK! I'm cancelling the class on Wed. July 4th. We'll be back on the following Wed. July 11th. For the week of October 17 through 22, the Unitarian Society holds it's annual Star King Rummage Sale. The entire facility is overtaken by the event, and so our usual location at Jefferson Hall is not available, nor are any of the other spaces in the facility. I explored several alternative locations, but I just couldn't afford the prices quoted to me. So, I've decided to cancel the class for this Wednesday, October 19. 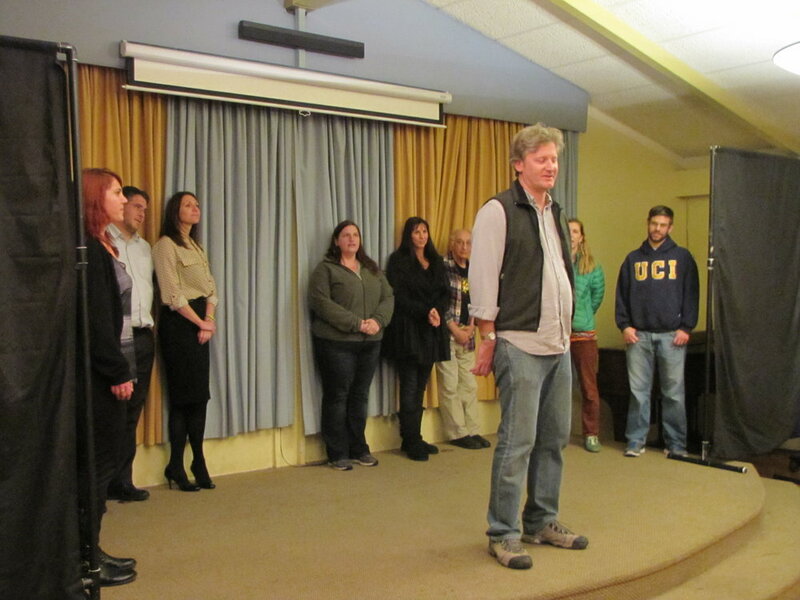 The Improv Workshop will be back the following week, October 26th at our standard time (7:30 pm) and standard location (1525 Santa Barbara Street). I hope to see you all there!